Whether you’re a returning The Division player or a fresh Agent, learning about The Division 2 skills is essential to conquering the Washington, D.C. wasteland. A number of skills and skill mods from the first game will be returning alongside a suite of fresh The Division 2 skills, making a total of eight skills, each one boasting between three and five mods. You’ll still be able to tailor your Agent to suit whatever playstyle you prefer, so if you want to make a support build capable of keeping your squad in the fight then that’s absolutely possible in The Division 2. Likewise, if you’re more interested in setting up devastating combos then skills like the Chem Launcher are ideal for you. Some of these skill variants are tied to The Division 2 Specializations, too so you’ll have to do some serious grinding in order to gain access to a few of these. Skills will be an essential aspect when it comes to creating your Agent build, so knowing each skill and the all of the ways you can mod each one will help a great deal when The Division 2 release date rolls around. This skill works a lot like a grenade launcher, except that instead of high-explosive rounds it fires a variety of different chemicals at enemies, making it great for combos and crowd control. At the time of writing there are four different chemical charges that you can load into the Chem Launcher. Send out a clear, but highly flammable gas that lingers over an area, then shoot into the cloud to ignite it causing massive damage to any enemies caught inside the cloud. This Chem Launcher mod is also great for creating chain reactions, so don’t just pepper the same spot with charges, spread them out a little. Root enemies to the spot with the Riot foam mod for the Chem Launcher. Much like the foam used by the The Division 2 True Sons faction, this foam will rapidly expand and solidify, immobilizing anyone caught in its area of effect for a short amount of time. You can free an ally caught in the foam by shooting it off them, which really doesn’t seem very safe. Shred armoured enemies with ease with the Oxidizer mod, which fires corrosive chemicals that eat away at armour and mechanical equipment. This is great for leveling the playing field. The Chem Launcher can also be used in a support role thanks to the Reinforcer mod, which fires a canister of armour-repairing goodness for your teammates to bask in. If any friendly comes into contact with the cloud it will repair a portion of their armour, while powder that sticks to the floor will grant a armour restoration over time. This is a powerful The Division 2 skill for digging in and defending. Drones make their way to The Division 2 skills list and come in a variety of forms, all equally annoying for enemies to deal with. Some drones will hover close to you to provide support, while others will hunt down and harangue enemies into making mistakes. Here are the five Drone mods. This aggressive drone variant is built for combat and will deal constant damage over time to its target, which you can select via remote orders. As the name suggests, this drone is all about covering your posterior. Activate this skill and a Defender drone will hover by you and deflect bullets using microwave bursts. This is a short-term buff however, as not only will the drone lose battery for every bullet it deflects, the drone is also incapable of defending itself from bullets. You can also order the Defender drone to protect allies. If you need more intel than the Tactician mod is for you. This drone will fly high over the battlefield and survey the action, spotting enemies and highlighting threat. This drone skill can only be unlocked through the Sharpshooter Specialization. The Bombardier drone strafes enemy targets with a cluster of explosions, dealing huge amounts of damage over a designated spot. Useful for tougher enemies. Like the Reinforcer Chem Launcher skill mod, the Fixer drone repairs armour over time, whether that’s for you or a chosen teammate. Fixer can also repair damaged skills. More drones! 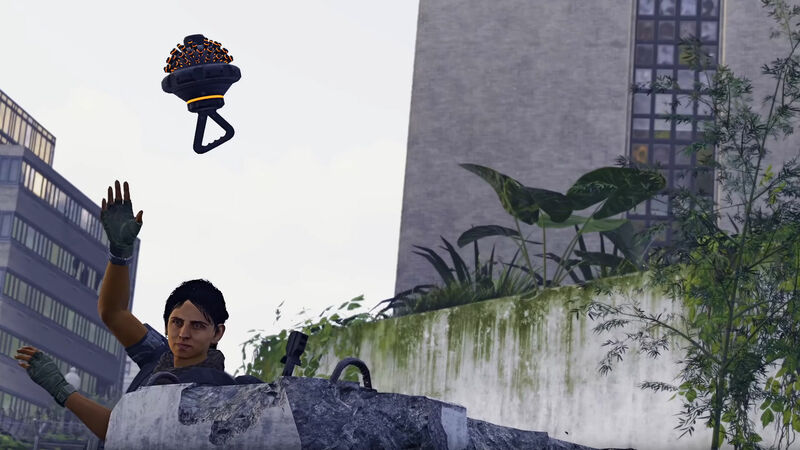 The Division 2 Hive is a cluster of small drones that hone in on targets and deliver various effects. These can be placed or thrown and will affect enemies in an area of effect. This skill tends to be used for defense, but there are a couple of mods that make it a powerful offensive tool as well. These micro-drones will swarm any target that enters their area of effect and deal damage over time, even to weak areas. Any friendly who is missing armour can walk within range of this Hive skill mod and instantly regain a chunk of armour. Administers general combat buffs to each player – movement, weapon handling, and physical capabilities are all improved. This Hive can be thrown near a downed teammate and releases a drone that will revive them. You can charge up this skill so that revived allies are brought back with additional armour and health. This ability is extremely helpful for reviving enemies in spots that are tricky to get to. The Seeker Mine returns from The Division with a few new mods. If you’re unfamiliar with this skill then the Seeker Mine is a self-propelled sphere that can target enemies or friendlies and deliver harmful or helpful effects. Like the Hive, these can be placed or thrown. The classic skill form pursues targets chosen by the user and explodes, staggering tough enemies. This can be dodged occasionally due to a short arming period before detonation. A slight deviation on the Explosive Seeker Mine, the Airburst instead reaches its target and unleashes a volley of explosions at their face. 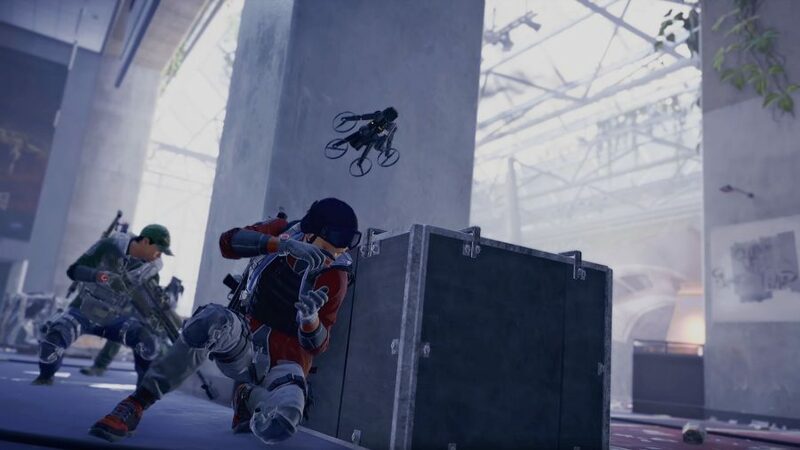 Yet another The Division 2 skill for support Agent builds, the Mender Seeker Drone will release a repairing chemical cloud around a designated ally or yourself. This skill mod is only accessible through the for Survivalist The Division 2 Specializations. What’s better than one Explosive Seeker Drone? How about a series of them each capable of hunting down targets on their own and dealing explosive damage on arrival. These smaller drones are not as adept at tracking target though, and are thus easier to dodge. Another returning skill from the first game, the Turret skill is a a small device that fires at targets in its sights or targets chosen by you. These can be placed next to you or thrown. Simplicity at its best – the Assault Turret can rotate 360-degrees and attacks targets with a machine gun. This skill mod restricts the Turret’s rotational capabilities to a small cone of effect, placing a lot of emphasis on tactical placement. On the plus side, it uses a flamethrower, so if you’re looking for crowd control or want to quickly delete enemies who are funelling toward you then take the Incinerator mod. You can toggle this on and off. Pick a spot and this turret will launch explosives at it. This Turret skill mod will fire once per key press and its shells will launch in arcs, making it possible to hit enemies behind cover. This The Division 2 skill mod is only available to the Demolitionist Specialization. Long-range, semi-automatic, and relatively high-damage – the Sniper Turret mod might take a while to acquire a target, but won’t take long to down them. 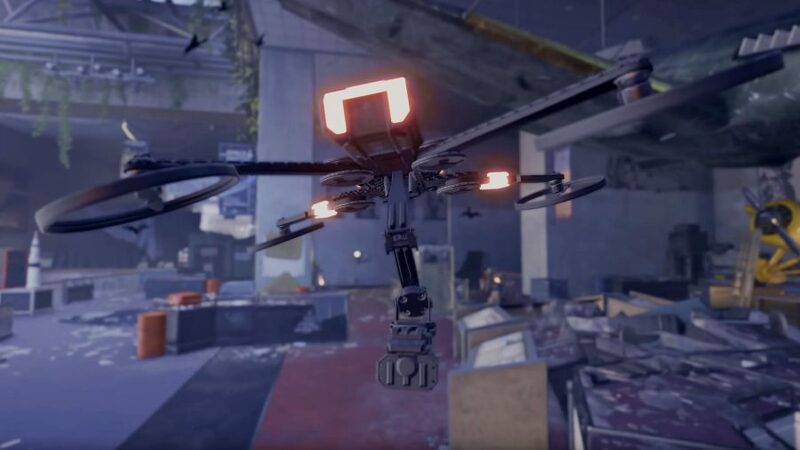 This flying drone will feel familiar to anyone who has spent with The Division. The Firefly is another airborne device that will react to enemy hostiles. The Blinder Firefly flashes targeted enemies, leaving them blind and unable to function at full combat effectiveness. The Demolisher Firefly destroys enemy weak points, Skill proxies, and even environmental objects. The Burster Firefly tags enemies with metallic shrapnel as it passes from one to another. If these hostiles get too close to one another, the Burster Firefly triggers a chain reaction, causing devastating explosions. Killing a tagged hostile also sets off the explosion on the next closest enemy. The Pulse is also making its return from The Division, but it works differently this time around. There is no long any damage boosts, no critical hit chance, and it comes in three variants which can be accessed by any Specialisation. This category of Pulse functions similarly to the basic Pulse in The Division – it scans the player’s surroundings for hostiles and marks enemies with a visual highlight. The most notable difference here is that the Scanner Pulse is explicitly used for intel. There are also talents that trigger when shooting pulsed enemies. The Jammer Pulse acts as an EMP, disrupting hostile electronics as well as other player Skills in an area. Players can press and hold the skill to activate an EMP with a larger radius. Finally, we have the Shield, which is also making a return from the Division. As you would imagine, it’s a defensive skill that deploys a shield to protect you or an ally from harm. As seen in The Division, this Shield category provides full-body coverage for players. Due to its size, only side arms can be used while the Ballistic Shield is equipped. In contrast to the Ballistic Shield, the lighter Crusader Shield exposes players’ legs and head but allows the use of primary weapons. Note that this does not include LMGs and sniper Marksman rifles. The smallest of all the Shields, the Deflector has a coating of micro-actuators that causes incoming bullets to ricochet to a nearby highlighted target with a clear line of sight to the Agent. Though not a full-body shield, the attention required to re-target means that only a sidearm may be used alongside the shield. That’s it for The Division 2 skills, every skill and skill mod currently known so far. For more on the upcoming third-person shooter you can read our suite of faction guides, covering the enemies you’ll face, from Hyenas and True Sons, to the Outcasts faction. Alternatively, you can read everything we know about The Division 2 raids. In the meantime, this information should help you start crafting your ideal The Division 2 Agent, ready to liberate the US capital.